Hello! I hope you are having a wonderful weekend : ) It has warmed up here in Central Florida. We are about to head out on a walk but I wanted to share a card I made this past week for one of the Verve release challenges. This one was a sketch challenge. I used 3 Verve sets on this card~Hearts on Fire for the hearts, Thankful Hearts for the sentiment, and Thankful Accents for the small heart by the sentiment : ) The dp is retired SU Bella Rose DSP. I love me some Verve : ) Thank you so much for stopping by, and I will have a couple more cards for you tomorrow! AWWW Kerri this is sooo pretty! 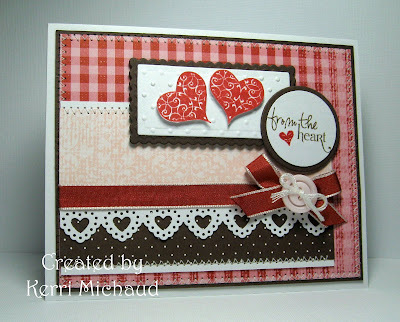 LOVE the layout, papers, gorgeous hearts and border!!! Beautiful!!! So so beautiful Kerri! Love the red, pink and brown together. I love that brown in there with the reds and soft pink....looks good enough to eat. I love that punch...I need that punch! This is Beautiful! I love the heart border, such a pretty touch. You have too much talent, Kerri. Pass some of your layering mojo my way! It's beautiful! This is absolutely beautiful Kerri!! Love the paper!! Stunning layout!! Beautiful!! By the way, I spotlighted your treat boxes on my blog today. Thanks for sharing the link to those templates. I am so enjoying making them!! Oh, how beautiful Kerri! I love how you combined all of the papers! Heart border is very nice touch, looks like a pretty lace! Really like the texture(embossing) you added too! This is so cute. I like the heart border and perfect Valentine card. Ohhhhh, ya know I LOVE that DP!! So sorry it retired...but you did an awesome job with it hun....LOVE that heart-border, and that yummy ribbon!